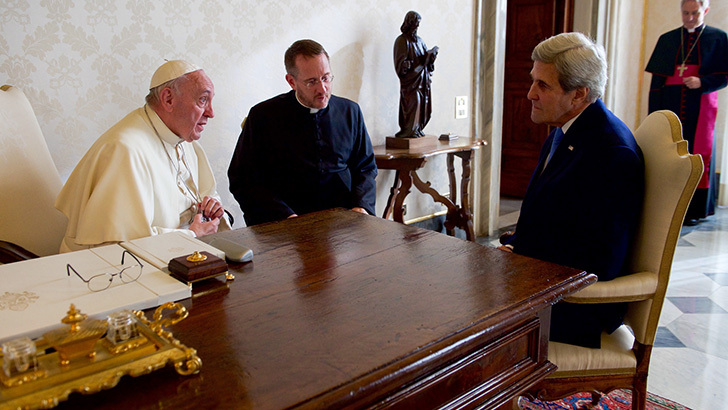 Photo: Former US Secretary of State John Kerry sits with Pope Francis, December 2, 2016, in Vatican City. At the State Department, my portfolio was closely aligned with my research specialization in religion and the environment, and it concentrated on engaging religious actors on climate change and other environmental issues. This involved serving as the liaison to the various faith-based organizations and religious leaders active on environmental policy issues. The work included organizing briefings for these groups to apprise them of the US government’s activities related to specific policies, most especially the Green Climate Fund and the Paris Agreement on Climate Change. Official US government positions on major issues—like climate mitigation and adaptation—are set by top political officials, but how these positions are communicated to stakeholders is itself a subtle form of policy construction. How and which information is disseminated to whom and how access to decision-makers is allotted to different stakeholder groups are overlooked aspects of foreign policy. Another principle activity involved translating my academic expertise into policy advisement. For example, I helped prepare several memos (“cables” in diplomatic speak) about the role of religious actors in responding to climate change. One of these focused on Laudato Si’, anticipating what the significance of Pope Francis’ encyclical on the global environment might be after the Paris Agreement was finalized. Working in concert with others in the Office of Religion and Global Affairs, I helped organize several events designed to include religion in policy discussions where such considerations are absent or peripheral: combating illegal wildlife trafficking, promoting energy efficiency, disaster response, marine conservation, etc. I feel confident that my expertise was relevant to policy goals that I strongly support: curbing carbon emissions, accelerating the transition to renewable energy sources, and helping vulnerable populations adapt to the harmful effects of climate change. But the AAR-Luce Fellowship in Religion and International Affairs is not simply about providing academic expertise to a bureaucratic institution eager to receive knowledge; rather, I see the program as an attempt to improve linkages between researchers and policymakers. As a participant in that broader conversation, I learned much more than I taught. Even though I already live and work in the Washington, DC, area and know many people who work for the federal government, I was surprised by the ways the institution felt like other institutions. The expectation of a giant impersonal bureaucratic institution is an enduring half-truth—the analyses of Weber and stories of Kafka deeply color our imagination. Certainly, it is true that federal institutions are often opaque behemoths brimming with paperwork and beset by procedure, but they are also far more flexible and unpredictable than I had anticipated. I also learned to speak a new dialect. The US government is riddled with jargon—there are binders of acronyms—and the style of communication is at odds with conventional forms of academic speech and writing. Comments at meetings are never circuitous, and memos, usually one page, never more than two, attempt to capture key information without over-determining its meaning. Unlike articles or monographs, memos and communiqués are genres in which arguments must be presented in an abbreviated, straightforward manner and with a specific eye to the potential of new knowledge for social or political impact. This style has its merits: succinct, jargon-free writing is good practice for grant-writing and the dissemination of research findings to nonacademic audiences. I have little doubt that I benefited from my fellowship experience, though it remains to be seen what impact my contributions might have on real policy. In any case, certainty about individual impact seems unimportant. What is most important is that a commitment to the public value of knowledge about religion necessarily involves trying to bring that knowledge to audiences of all kinds, including governments. Our knowledge circulates through systems of power in both disruptive and reinforcing ways, and religion scholars can be more or less agential about this. As we scholars of religion work to address the public understanding of religion, heeding calls for improved religious literacy, and meeting demands to disseminate our knowledge to various publics, it is important to identify and experiment with new ways to engage audiences beyond the classroom and academic publications. Evan Berry is associate professor of philosophy and religion and codirector of the ethics, peace, and global affairs master's program at American University. He was the first recipient of the AAR-Luce Fellowship in Religion and International Affairs, which funded Berry to work in the Office of Religion and Global Affairs as a Franklin Fellow at the US Department of State.